Chris Roberson is writing a Captain Action mini starting in September! I don't really know how they can make all that work, but I look forward to seeing the attempt. "Masks" has become the latest of Dynamite's projects to build its own mini line out of the initial series with "Black Bat" and "Miss Fury" following in their own books. What's your plan for the franchise long term? Is there more work you'd like to do in this world? I probably can't say too much. Initially I signed on to do this one, and I wanted to work with Dynamite for a long time because they control a lot of licenses that I'd like to work on. My run on "The Shadow" came about, I think, because they were happy with the work I was doing on "Masks," and there is another follow up we're doing after that. It hasn't been officially announced yet, but that should be coming soon. It's not a direct sequel like "Masks 2" or anything, but it does have a similar kind of structure with overlapping groups of characters, but it's set in a different time period and has a different kind of vibe to it. Easy to see why he couldn't say a whole lot more at the time. After seeing the cover,I,m in. This is going to be cool, lot's of buzz on Twitter about it right now! Yep.. it sounds interesting. I just I can afford it then. 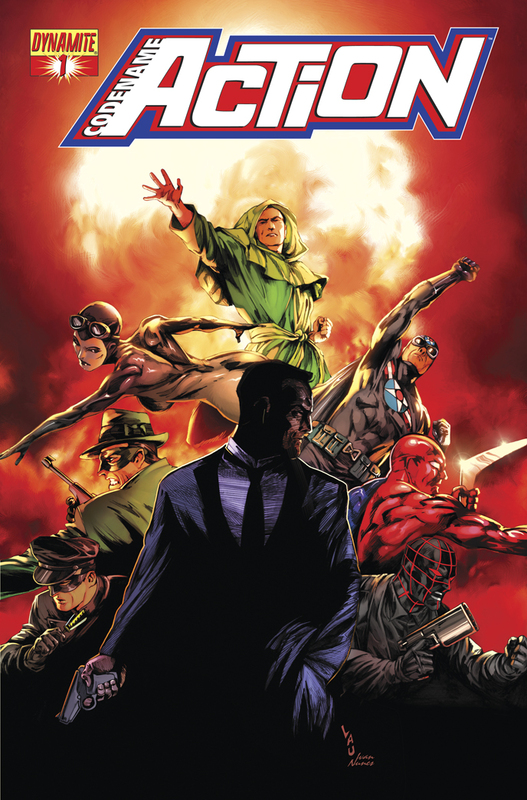 Doesn't look true "pulp" to me more so than James Bond meets golden age heroes, but it does look damn interesting. This is great News I'm In! Eh, too 007 for me so far. If this was similar to MASKS 2 (which I still think they should do) than I'd be head over heels for this, but it seems very Bond like and too weird of a pairing. We'll see how it turns out. I just don't see how it can work with the established timeline(s). Unless, once again, they are totally different versions of characters. Especially since they refer to it as a bridge. I don't want to stress too much over these things, knowing that comics timelines can be a little fluid, but I do like solid continuity in the books I read. sign me up. glad to see Captain Action back. I'm going to give it an issue or two to entertain me, but if the story is going to be more "spy" or "James Bond" than pulp and action heroes than I'll be passing on it. With all these great Project Superpowers and Pulp characters Dynamite has we should be seeing amazing stories based upon those worlds, not espionage and 60's Bond types. With all these great Project Superpowers and Pulp characters Dynamite has we should be seeing amazing stories based upon those worlds, not espionage and 60's Bond types. can't there be room for both? i agree with son of Tarzan here.